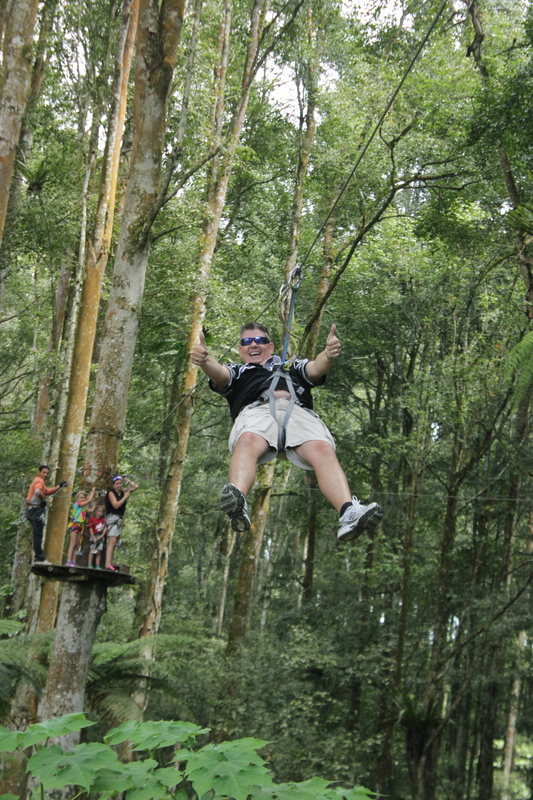 The Treetop Adventure Park in the Botanical Gardens in Bali gave us several hours of thrills and excitement. 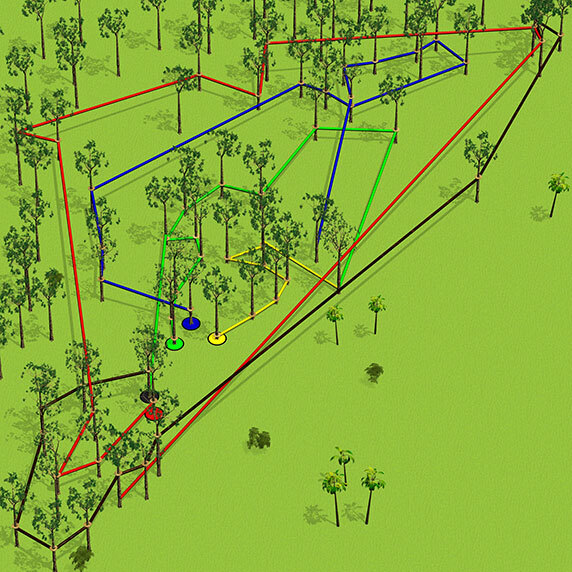 There are 7 adventure circuits within the trees from between 2 – 20 meters high. 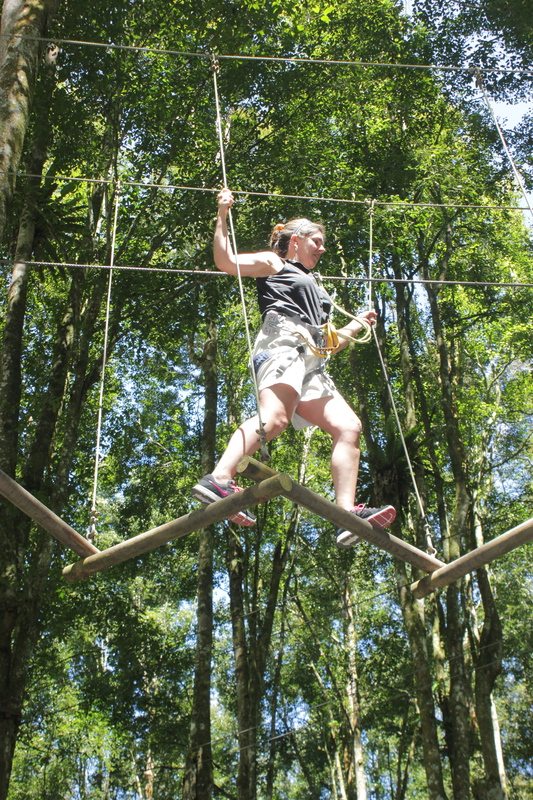 In total there are 72 challenges including Suspended Bridges, Spider Nets, Tarzan Jumps, Flying-Fox, Flying Swings, and many more fun challenges. 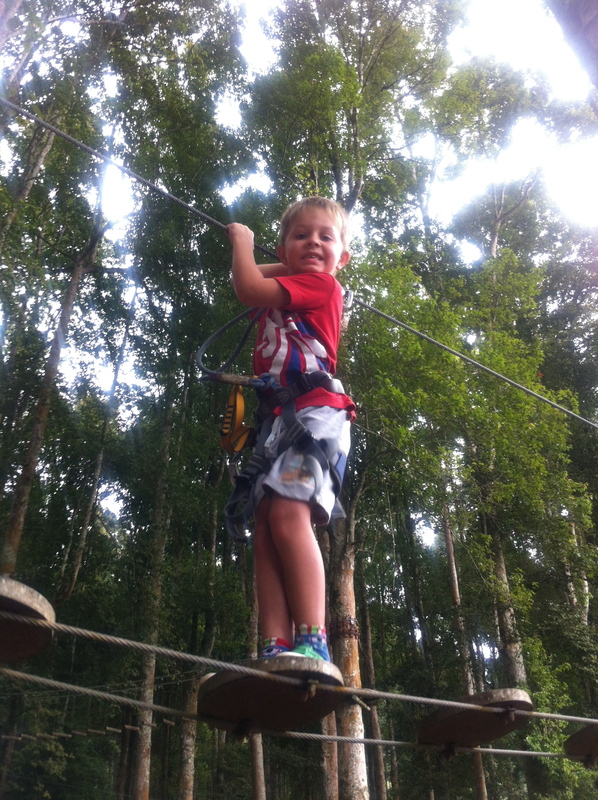 All of the circuit platforms are held in place using an innovative compression system to protect trees from any damage and all of the cables are protected from cutting into the trees. 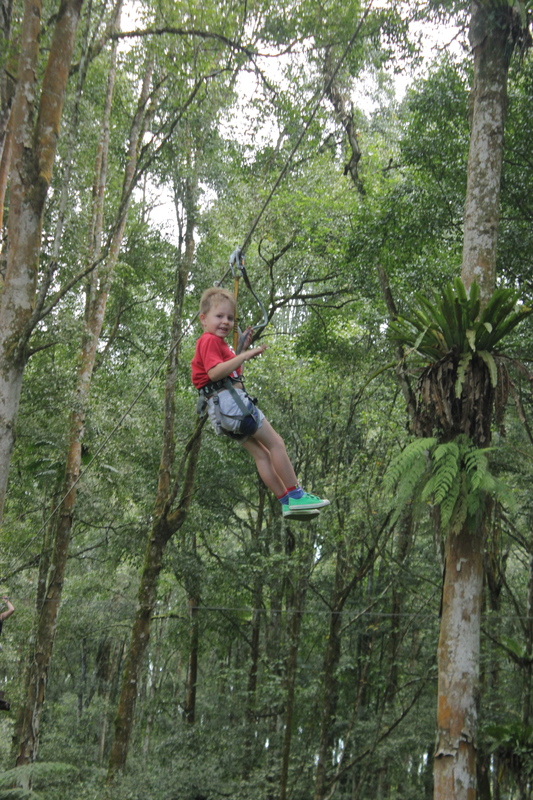 Once we arrived, we were kitted up in the safety harnesses with pulley and carabiners. 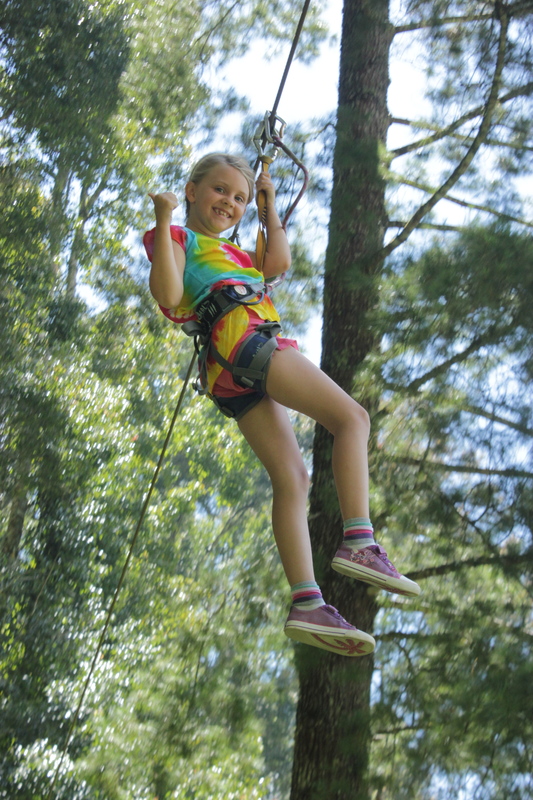 We then completed the training circuit where all of us learned how to work the safety harness (1 of the 2 carabiners must always be attached to the guide wires) and how to work the pulleys for the flying fox zip lines. The different circuit levels for ages 4 – 74! 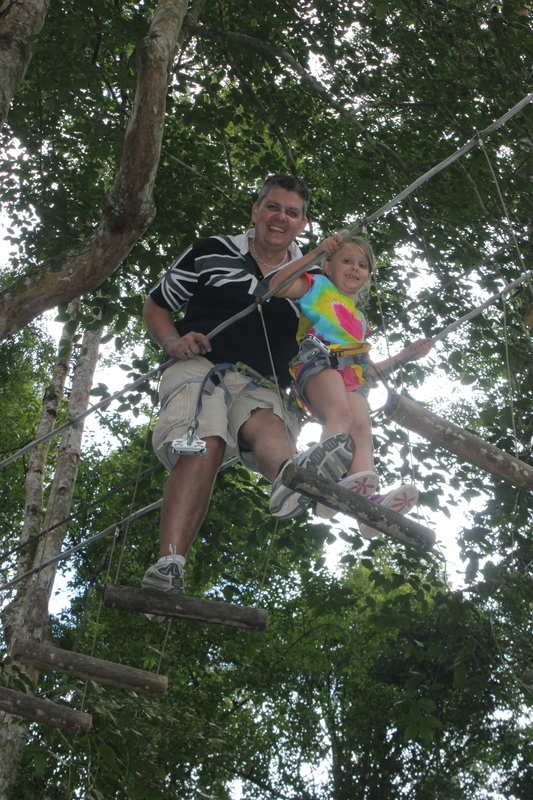 The 4 of us having fun on the wires in the treetops! We started on the Squirrel Yellow Circuit and Isabelle was straight up and taking the lead. 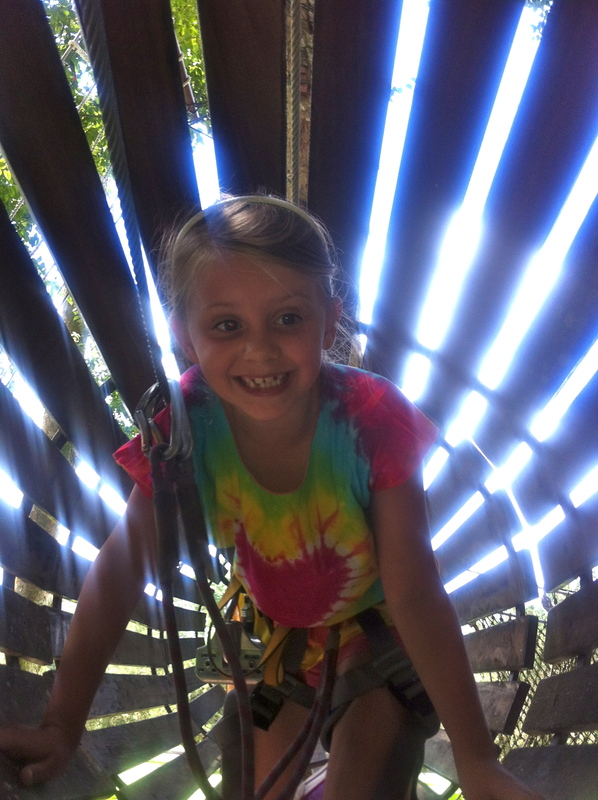 She was so confident and having so much fun doing it! She was a little scared at some points but managed to keep going. Oliver, who always wants to do everything that Isabelle does, kept up with us all on everything! 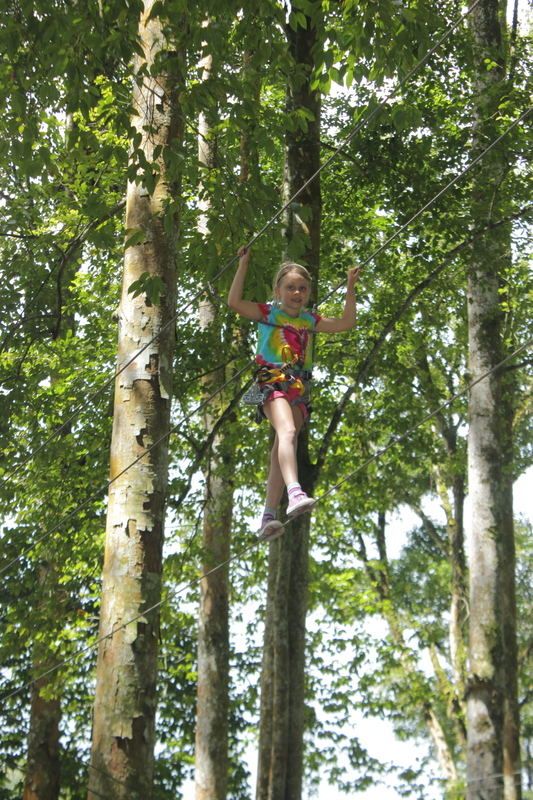 Isabelle high in the trees! 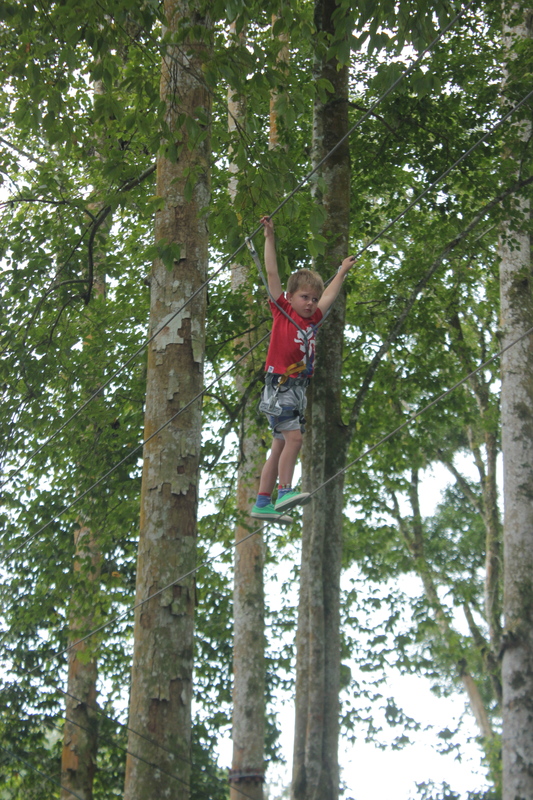 Oliver climbing like a monkey! 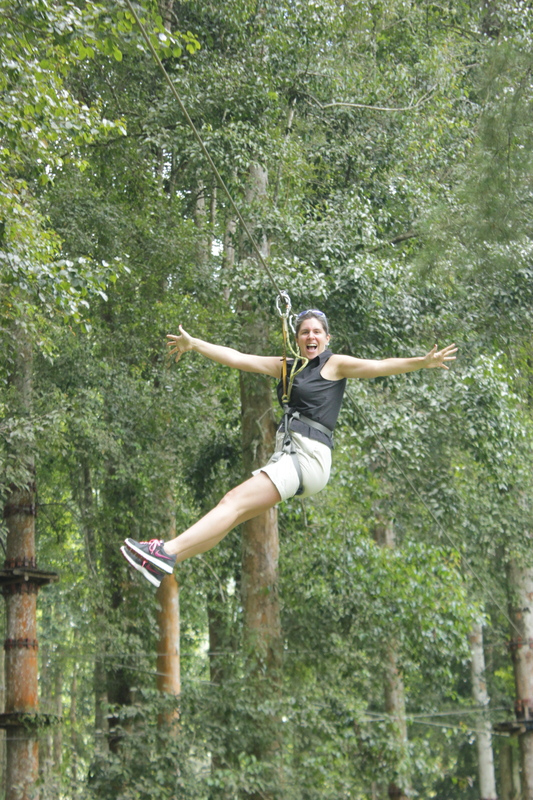 Me getting confident on the Flying Fox Zip line – look, no hands!! Once we had finished the Yellow Circuit, we went on to do the Green and Orange Circuits. 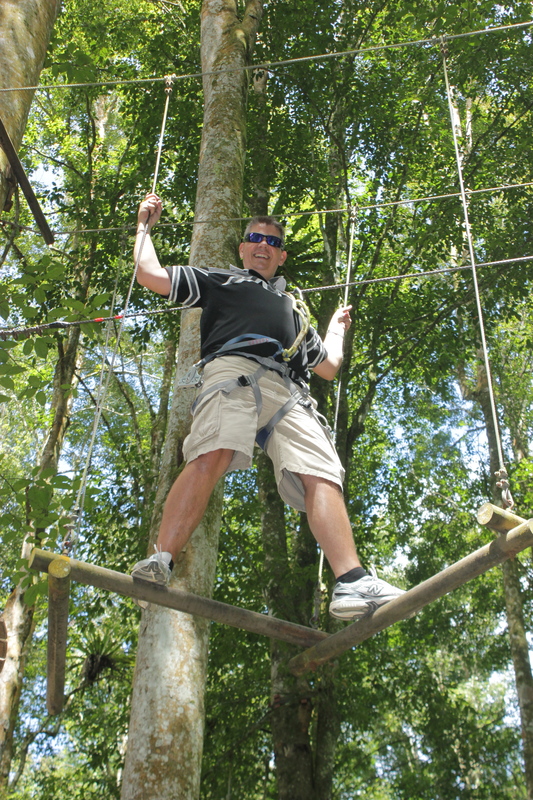 My heart was thumping on the Orange Circuit, and I was not sure that I was going to be able to finish…… (I used to be such a dare devil, but the older I get, the more I do not like heights). However, seeing that Isabelle and Oliver had both finished this round, I could not let them see me wimp out! Super nervous on this one. Owen had to talk me through it! I was so happy to finish this circuit! After we had completed the 3 circuits that the kids could do, they wanted to start all over again! So, we went round again, but this time Oliver went first. Owen and Isabelle on round 2! 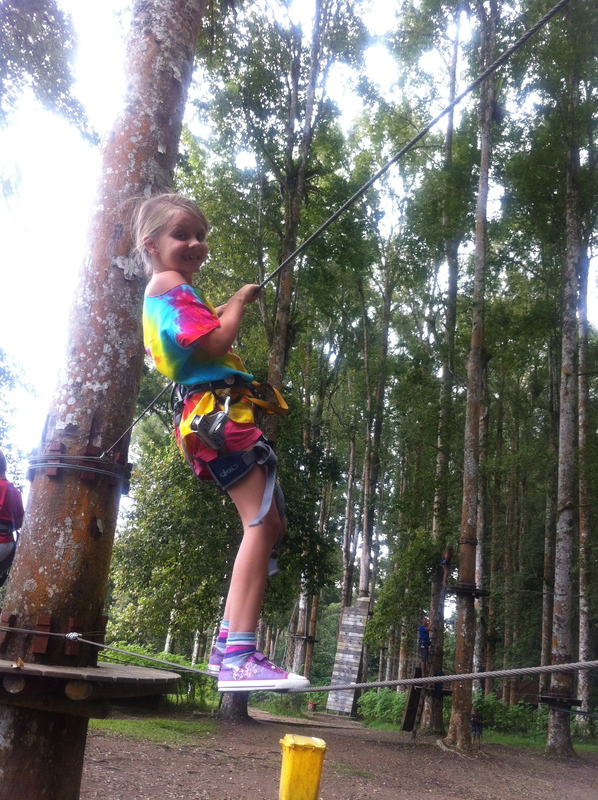 Wheeee – we love Bali!!!! 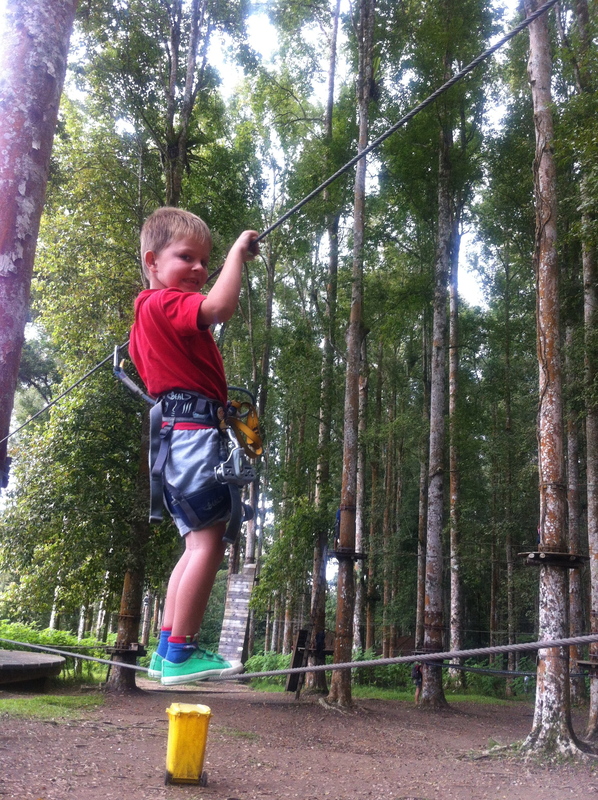 This entry was posted in Uncategorized and tagged Bali, Flying Fox, Kids, Owen, Tarzan, Treetop Adventures, vacation. Bookmark the permalink. 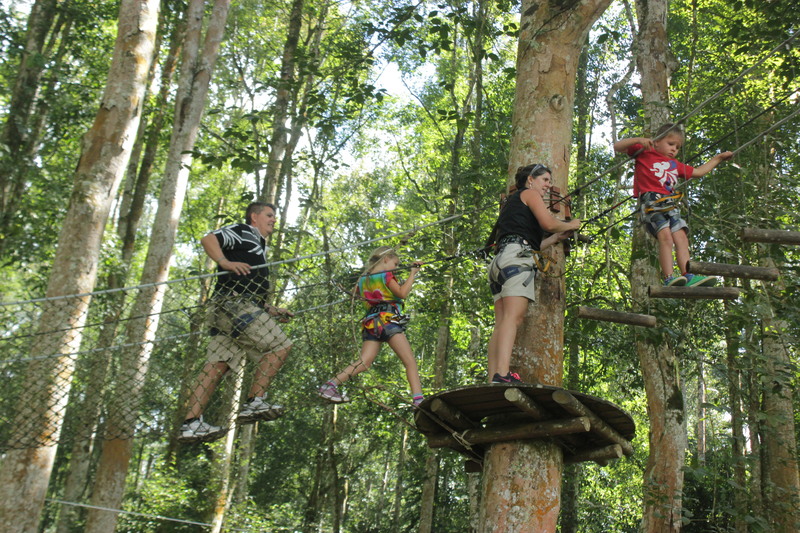 I am happy that you and your kids had great time in Bali Treetop. I am Chris of Adventreez/Skyzip. We built Bali Treetop in 2005, but more recently and nearer from you, we built one in Guilin and last June another one in Nanjing, at the zoo. You can check the Nanjing website here: http://www.njjwn.com/.